During the summer months, which is the rainy season, gigantic blackberries take over the culinary stage in the town of Valle de Bravo, Mexico. They can be the size of a plum, bursting with wine colored juice that is at once sweet and tart and addicting. Literally every morning, women come down from the mountains and valleys to the town’s market with buckets of these fresh picked gems. Of course, they sell out in a matter of minutes. What to do with them? Oh first of all, eat them by the handfuls straight from the buckets. Just like that. Or puree them raw, maybe with a bit of mint and pour them over vanilla ice cream or pound cake. Or you can eat it like a cold soup! But one of my favorite things is to use them as a topping for cheesecake. Blackberry cheesecake is definitely a thing Mexican kitchens have been doing for a while. 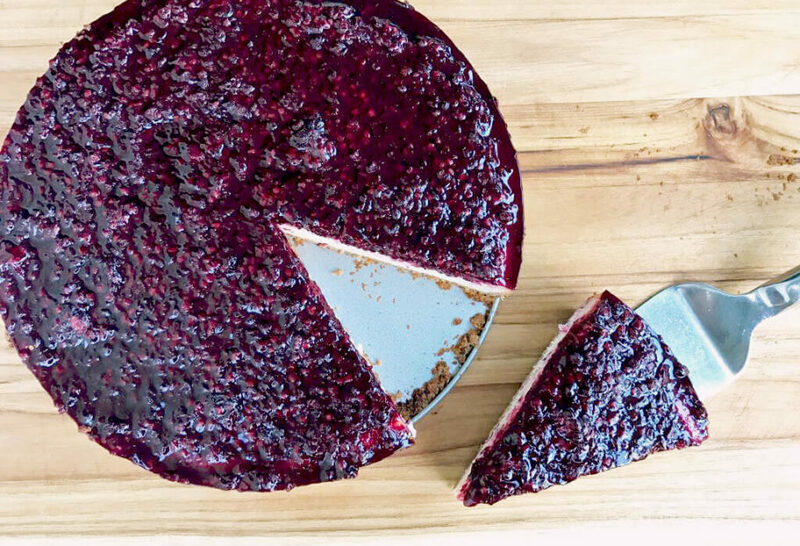 Yes, we have chocolate cheesecake, cajeta cheesecake, strawberry cheesecake… but what is considered the traditional topping in Valle de Bravo is a kind of blackberry jam. Here I am trying to replicate my favorite ones from Valle de Bravo, as Juju and I just went blackberry picking a few days ago. 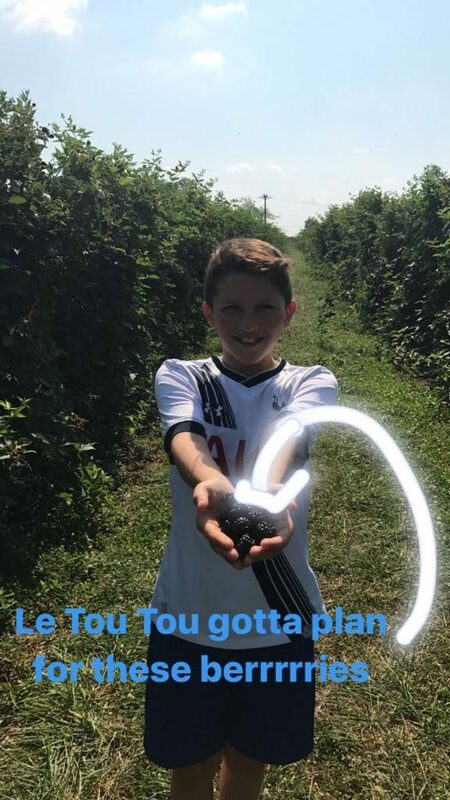 Blackberry picking with my youngest boy, Juju… He was showing me how to do Instagram Stories as he is much more tech-savvy than me. You can view our stories on my Instagram. There are three parts to this dessert – all super simple to make. But each one needs to be just right, so here are my notes on that. For the crust: After the crumbled crackers are mixed with the melted butter and dash of cinnamon, they need to be applied with pressure to the bottom of the mold creating a somewhat even bottom crust with a gentle rim going up the side. And it is absolutely necessary for the crust to set and chill before the cheesecake mixture is added. If not, the crust will not stand tall underneath it, and it will lose presence. For the filling: I like it rich and super moist. For me, that means adding sour cream, which also gives it a refreshing tang, and cottage cheese, which adds a gentle saltiness. With this kind of mixture, it is important to not over bake. As your timer kicks the 55-minute mark, stand at the ready to take it out. It should look puffed up and gently browned on top and a toothpick inserted in the middle should come out just moist, but not with any of the filling covering it. For the topping: I like to add unflavored gelatin to help it set. This creates a defined layer that will not run all over the place. After the blackberry mixture has boiled, and it has been mashed and the gelatin added, let it cool just to room temperature and then pour onto the cheesecake and chill. You don’t want the blackberry topping to begin to set in the saucepan. Of course you can make the cheesecake with many other toppings, but before you consider that, give this one a try. For the crust: In a bowl, combine the melted butter with the graham cracker crumbs and cinnamon. Scrape onto a ring mold pan. Press around with your hands or the back of a tablespoon to make the bottom crust as even as you can, and push on the sides, to give the crust a short gentle border of about 1/2-inch in height. Cover and place in the refrigerator to chill while you make the filling. Preheat the oven to 350 degrees Fahrenheit and set the rack in the middle. For the filling: In the jar of a blender, add the eggs, cottage cheese and sour cream. Process until smooth, Incorporate the cream cheese, sugar, vanilla extract, cornstarch and salt, and puree again until fully incorporated. Remove the crust from the refrigerator, pour the mix from the blender on top, jiggle a few times for it to spread evenly. Place in the oven and bake anywhere from 55 minutes to an hour until set. A toothpick inserted in the middle should come out just moist, but not with any of the filling covering it. Remove from the oven. The cheesecake will be very puffed up. As you take it out of the oven it will settle and deflate a little, and cracks may appear on its surface, which is totally normal. Set aside and let cool. For the topping: In a medium saucepan, combine the blackberries, lime juice and sugar and set over high heat. Once it comes to a full boil, stir and let it continue to cook for 2 to 3 minutes while mashing with a potato masher or mallet. Remove from the heat, add the contents from one envelope of unflavored gelatin. Stir well until fully dissolved and let cool until lukewarm or at room temperature. To assemble: Pour the cooled blackberry mixture onto the cooled cheesecake. Cover with plastic wrap and place in the refrigerator for at least a couple of hours so that the cheesecake chills and the blackberry topping sets. Remove cheesecake from the refrigerator. Have a cup with lukewarm water and wet a normal dinner or butter knife. Run it around the edge of the mold all the way around and going down to the bottom. Release the mold and serve. Leftovers can be stored covered in the refrigerator. Pretend I am there too. Oh thank you so much, Marj. Pati, when are you coming to the DFW area? Would love to take your cooking class. I’ve been a huge fan for years and use your cookbooks religiously. When I moved to the North East I missed my Mommas cooking so I taught myself how to make all our wonderful Mexican Dishes. Gracias por tus recetas deliciosas!! Thank you so much for being a huge fan! I hopefully will get to DFW soon. Sounds great, but confused about the term “ring mold pan”. In the picture, looks like a springform pan was used. If so, what size is it -like 8″, 9″ or 10″. I live in Baltimore and absolutely love your show. This is the first recipe I will try. I love it when you have your handsome sons on the show. I am partial to JuJu. Thanks–Also, do you give any cooking classes in D.C.? Your first recipe! How exciting…I hope you love it. I used a 9-1/2″ spring form pan but you can use a pan anywhere from 9-10″. I do teach cooking classes in DC…here’s more info https://patijinich.com/category/upcoming/ Also keep an eye on that page, as I sometimes do other local events as well. Patient I am going to make this, blackberries are my favorite. Yay…I hope you like it Sheila. I made your blackberry cheesecake today. It is very delicious. Thank you so much for the fabulous recipe! I used a 10 inch spring form pan. It turned out perfectly. Rita, that is so wonderful to hear! Thank you. This recipe looks wonderful. I have a family of cheesecake lovers and am anxious to make this for them. Please tell me, on my recipe, it says 1-1/2 cups of cottage cheese twice. Is that correct? Really, my mother’s recipe and father-in-law’s recipe for cheese cake calls for cottage cheese. Many of the recipes I have found for cheesecake before yours call for mostly cream cheese. Those are very good also, but am happy to have found your recipe with cottage cheese. A family of cheesecake lovers…wonderful! The recipe uses 1-1/2 cups of cottage cheese, 1-1/2 cups of sour cream, and 1-1/2 cups of cream cheese. pati’s the real deal. loved her from the start. I have Parkinson’s, so I don’t cook much lately. but I can just about taste what pati makes on the show!! Thank you so much Lou! Sending you my best. I love this recipe although I substituted chopped fresh black cherries for the blueberries and cheated by using regular cinnamon. JUST GREAT! My 9″ springform pan worked fine. Best Always. I remember picking wild blackberries with my niece elsa, along the Oregon coast (nehalem was the town, I think). my sister (elsa’s had just been killed by a drunk driver (join MADD), so I was visiting. elsa was just four, pablo was ten months. anyway, we picked lots, and they were delectable. can’t wait to make this. Thank you for sharing Lou. After sending off an email to you, I thought I might get a faster response this way. What SIZE springform pan did you use? I know baking time will be off if not baked in the right size pan. Mary I just replied to your email…I used a 9 1/2″ pan. I enjoy your recipes and this cheesecake recipe sounds delish! Blackberries are my favorite! What size pan do you use and is it a springform pan? 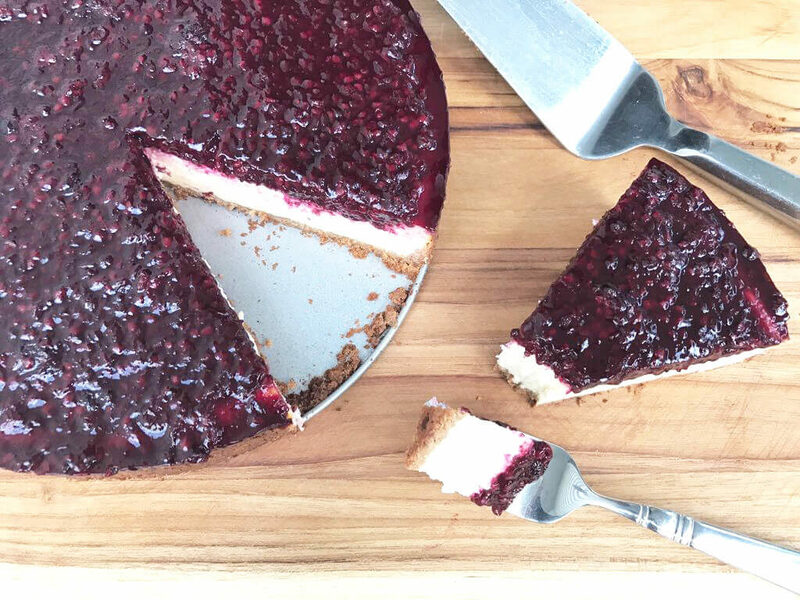 If blackberries are you favorite, you will love this cheesecake Doris! I used a 9 1/2″ pan, but you can use a pan anywhere between 9″ and 10″ and it should work. I always try and catch you show on PBS. I love your journey’s and look forward to the recepies. Keep smiling. Thank you for always tuning in Gail :)! I used a 9 1/2″ pan, but anything between 9 and 10 inches should be fine. This looks so delicious… also, I can’t believe you reply to all the comments. Is it really you? If so, I am super impressed! Love your show. Yes, it’s me Linda! Connecting with my fans is so important to me. You too Ted and Gloria! Love your program, I love to see other recipes being shown to the public, especially when you show that, there is more to Mexican food other than tacos which I do love, that our food history is a mixture of many types of races coming together from many countries. Thank you for that. Carmen, thank you for your lovely comment. It means so much to me. That looks delicious, can’t wait to try it. Thanks for sharing. Looks very yummy. Can’t wait to try this recipe. Thank you Patti for sharing. What else and in what proportions can we use to replace the blackberry topping? Can we use stone fruits like peaches or cherries? We are allergic to all berries except for blue berries. Any fruit would be delicous…including mangoes. I can’t wait tomake the ingredients come together and share in pure bliss! This cheese cake does not appear to have been backed in a ring mold pan — no hole in the center. Would it actually be a spring mold pan instead?. I have never made a cheese cake, but I think that might be the correct pan. Am I correct? Oh yes…I used a spring form pan. Sounds delicious!!! Can’t wait to make it for the family! Hope the whole family loves it! This sounds like a wonderful addition to any summer meal. Will definitely give this one a try.